Yes and no. You can use a regular soft toothbrush, but most orthodontists recommend an orthodontic-cut toothbrush, where the bristles in the middle are lower than the bristles on the edges and cut into a "v" shape. You can also use any electric toothbrush, such as a Sonicare or Oral-B Braun . These do an especially good job of cleaning your teeth. To floss your teeth, you don't necessarily need special floss. You can use any type of floss with a plastic threader needle such as BridgeAid. The plastic threader helps you bring the floss under the arch wire for each bracket. To make things easier, there are also several types of "threader floss" which is a length of floss that has a built-in stiff threader end. Some popular brands of threader floss are Thornton 3-in-1 Floss, SuperFloss, Crest Glide Threader Floss, and SturdyFloss which was created by a dental hygienist. An enterprising orthodontic patient even invented a tool he calls "FlossFish" to help you floss under your brackets with any type of regular dental floss. Many of these flossing tools can be found at DentaKit.com or many online drugstores. You might also want to get a small spiral dental brush (sometimes called an "interproximal brush" or a "proxi-brush") or a rubber-tipped stimulator to help clean food debris out from between the brackets before you brush. A WaterPik or a device like Oral Breeze's QuickBreeze (which attaches to your sink faucet) or ShowerPik (which attaches in your shower) are also helpful. And finally, you will need some dental wax, because inevitably, the brackets will irritate the insides of your cheeks at first and you will want some relief from the irritation. Why do you need to use wax when you have braces? Wax helps to create a barrier between the bracket and the inside of your cheeks and lips. It helps prevent the bracket from irritating your cheeks or gums. At first you will probably use a lot of dental wax, but as your get used to your braces and the insides of your cheeks "toughen up" you may wind up using less. How do you use orthodontic dental wax on your braces? To use dental wax, break off a tiny bit of wax from the container, smoosh it with your fingers a bit to mold it, then place it directly on the bracket that is causing the irritation, as shown in this photo. Dental wax is non-toxic, so it's ok if you swallow it. Wax tends to break down over time, so you'll probably have to apply more after eating a meal. Take off the wax before you brush your teeth, or it will gunk up your toothbrush. Dental silicone, such as Ortho-Sil is a little different. It lasts longer than regular dental wax. Your brackets must be extremely dry when you apply dental silicone, or it will not stick to them. Some people love dental silicone and some prefer regular wax. If you have never used OrthoSil, ask your orthodontist for a small packet, or buy just one container to try before buying a large quantity. Usually your dentist/orthodontist gives you some dental wax after you get your braces put on. Most pharmacies (both online and local) carry dental wax. DentaKit.com also carries silicone dental wax, as well as several types of lip protectors which are alternatives to wax. What else can you use to ease irritations inside your mouth in the first weeks of braces? A warm salt water rinse, several times per day, can be very soothing. But if that isn't enough, try a mouth rinse called Rincinol PRN , which helps to heal mouth sores. You can find this product at many stores online, or at your local drugstore or pharmacy. You may also want to read our page of suggestions about canker sore remedies, which contains many suggestions. First, rinse with warm water a couple of times to dislodge any food particles. You can also use a rubber-tipped gum massager to dislodge any particularly stubborn particles that are badly stuck in your brackets. Now you can use a small amount of toothpaste and brush your teeth. It is best to use circular, vibrating motions around the gum line. Angle your toothbrush above and below the brackets. Scrub each surface of every tooth with 10 strokes of the toothbrush. This should take several minutes -- be as thorough as possible. Don't forget to also clean the surfaces of the molars and to also brush your tongue! Can you use whitening toothpaste when you wear braces? It's probably best not to use a whitening toothpaste until after your braces come off. If you use a whitening toothpaste on a daily basis, the teeth underneath the brackets may not be as white as the rest of your teeth when your braces come off! How do you floss your teeth with braces on? It's a little tricky at first. You must thread the floss under the arch wire between each tooth, floss under the gumline, then remove it. Repeat for each tooth. At first it will take about 15 minutes to floss all of your teeth, but with practice you will get faster and more efficient at doing it. It is important to floss EVERY NIGHT. Even if you use a Waterpik device, you should still floss. Braces are notorious for hiding tiny pieces of food you could have sworn were rinsed away! You can use any type of floss that is comfortable. 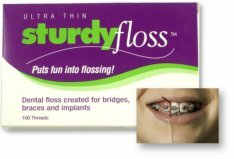 Most people attach the floss to a plastic needle called a Floss Threader, or use floss that has a stiff end, such as SturdyFloss or Glide Threader Floss, as mentioned a few paragraphs earlier. Most people who have braces carry a little dental kit to help them in such situations. A dental kit should contain a dental pick, some floss and floss threaders, a toothbrush, and some toothpaste. A travel cup is also a good idea. It is easy to put one together yourself. 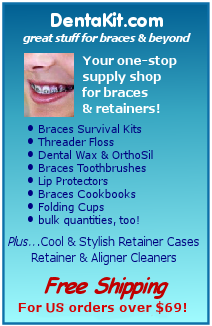 All these items are compactly offered in a product called DentaKit Braces Survival Kit, which is pictured here on the right. This is a product that I created a few months after getting my braces. I needed a kit like this and couldn't find one anywhere, so I created one! Like most people, I started out by putting some stuff in a baggie, and then a small cosmetic bag. One of the advantages of the DentaKit product is that everything is held securely in the pockets, making it easy and convenient to use. All the tools included in the kit are designed to help you clean your braces. Thousands of orthodontic patients worldwide have bought this kit and tell me that they consider it a valuable tool in helping to keep their teeth and braces clean. 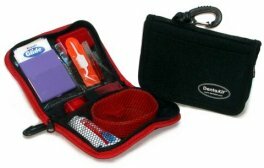 It includes everything you need to clean your braces "on the go," including a unique leak-proof pop-up folding cup, and extra pockets to put lip gloss, Chapstick, or hand wipes.